Australia and Brazil have had some tough battles over the years. 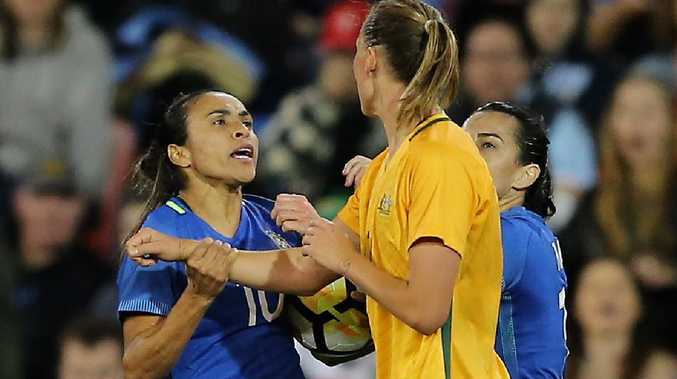 Australia have been drawn against old foes Brazil, as well as Italy and Jamaica in the group stage for next year's women's World Cup in France. Alen Stajcic's side discovered their fate following a high-profile draw in Paris early on Sunday morning (EST) which leaves them primed as one of the favourites for progression from Group C.
The clash with Brazil will revoke memories of Australia's memorable victory over the South Americans at the 2015 World Cup when they claimed a superb 1-0 victory to reach the quarter-finals. 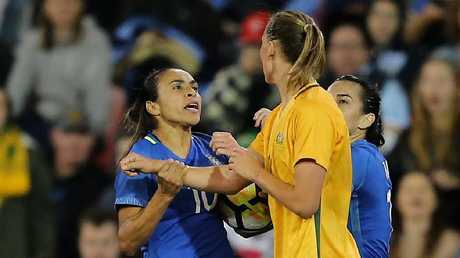 Australia will kick-start their campaign against the Italians at the Stade du Hainaut in Valenciennes on Sunday, June 9 before meeting Brazil at the Stade de la Mosson in Montpellier four days later. They will complete their group stage matches against Jamaica's Reggae Girlz at Grenoble's Stade des Alpes on June 18. The Matildas lost to Brazil at the Rio Olympics in a heartbreaking quarter-final penalty shootout but have won all four matches against them since the 2016 Games. Australia have only played Italy once since 2009, claiming a a 5-2 victory in 2014, while the showdown with Jamaica will be a first match between the two countries. As one of the seeded nations for the tournament the world No.6-ranked team knew they would avoid defending champions United States, hosts France and powerhouses Germany, England and Canada. Gunning for their first World Cup triumph, the Matildas should be confident of getting to the knockout stages as the top two sides in each of the six groups, as well as four third-placed finishers, will make it through to the last 16. Australia will finalise a base camp, travel and their warm-up match schedule for the lead-up to the tournament in the days following the draw. Meanwhile, three-time winners USA, the only country to win the World Cup more than twice, will be among the favourites for more glory after receiving a favourable Group F draw with Thailand, Chile and Sweden. The tournament kicks off in on June 7 when first-time hosts France play the opening match against South Korea in Paris, with Lyon hosting the final on July 7.